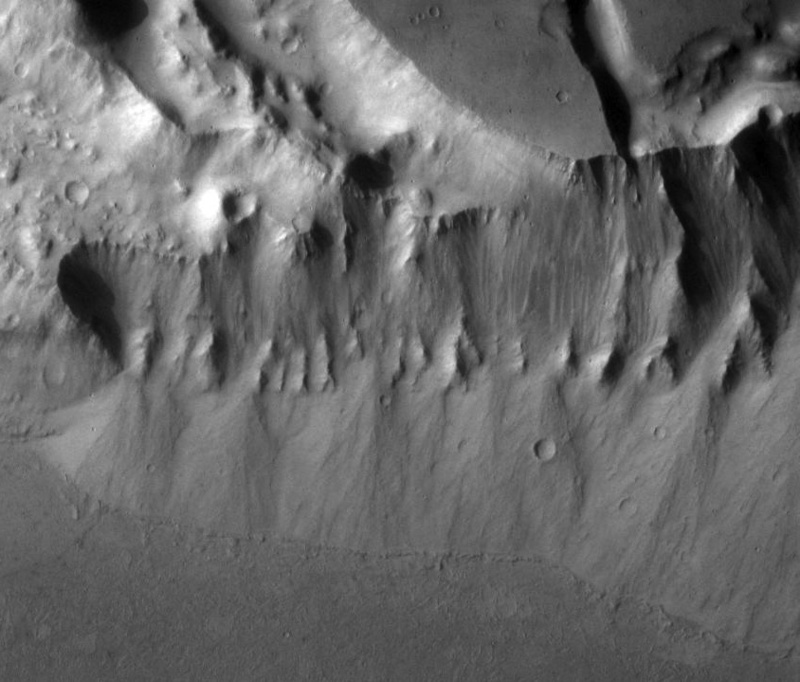 Channels eroded by a flowing medium such as water show characteristic features. Scientists can study these to investigate how a channel forms and evolves. The data can tell them about the conditions when the stream or river was active. Teardrop-shaped islands stand in the beds of most large outflow channels such as Kasei. These islands mark where rock outcrops made obstructions that successfully resisted the floods — or which stood above the floods' high-water mark. Every such island marks a location where hard rock proved tougher than eroding floodwaters. Along the banks of the channel, and on the flanks of some islands, images show ledges or benches. These indicate especially resistant rock layers — or where the flood maintained a depth long enough to erode the bench. 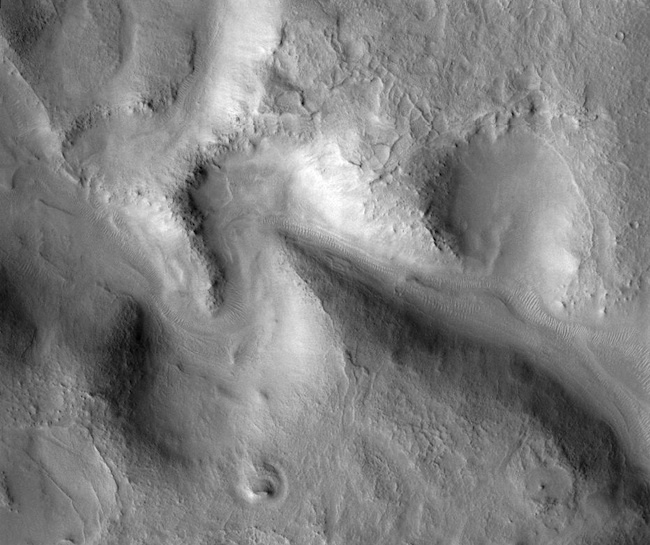 Some islands in outflow channels show an impact crater at their upstream end. An island forms in a channel behind a crater because the impact and its ejected ring of debris make a rocky, high-standing hill. This resists erosion much like an ordinary outcrop. After floodwaters divide around the crater, they progressively erode the ground behind the obstruction. The result is a teardrop island stretching downstream like a pennant. The faster the flow, the longer the island. Teardrop-shaped islands stand in the beds of most large outflow channels such as Kasei. Many such islands (though not all) have an impact crater at the upstream end. An island forms in a channel behind a crater because the impact and its ejected debris make a rocky high-standing hill that resists erosion. The floodwaters divide around the crater, then progressively erode the ground behind the obstruction. The result is a teardrop island stretching downstream from a crater like a pennant. The faster the flow, the longer the island. 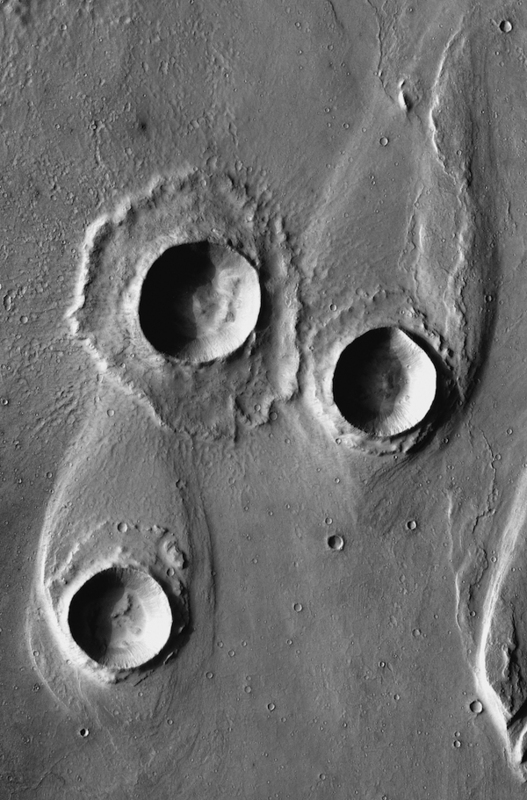 Yet impact craters are not necessary to create streamlined flow-forms in channel beds. Any topographic feature that is resistant or rises above the flood level and causes the water to divide around it will produce a streamlined island or mesa. Similarly, outcrops of especially tough rock can also produce flood-sculpted features immediately downstream. Terraces frequently appear on the banks of channels, especially the sides of streamlined islands. A terrace indicates that a stream maintained a flow at that level long enough to erode the terrace before the amount of water decreased. Another cause for a terrace might be a flat-lying layer of tougher rock — a sheet of lava, perhaps — that resists erosion better than the layers above or below. As you can imagine, scientists cannot always separate which of the two causes is dominating in any particular location. A large flood of water carries along rocky blocks or boulders torn from upstream sources. These gouge and abrade the channel bed, producing long lineations, which the floodwaters may enlarge through scouring. 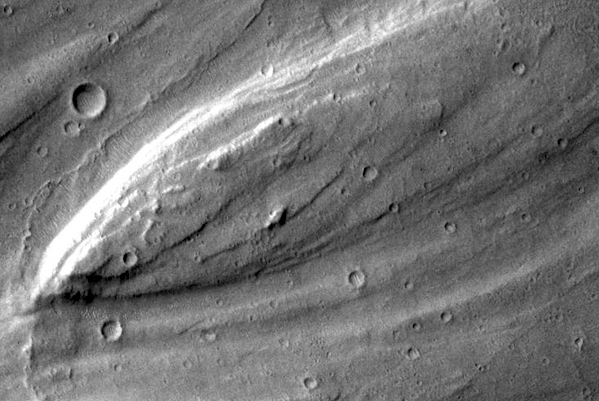 Such linear marks appear in portions of most outflow channels. Where streams have steep slopes and carry a heavy load with large quanity of coarse sediment, they often form a channel that is wide but relatively shallow. And the channel bed contains a number of smaller channels that merge and seperate many times in a complex network. Scientists call this a braided stream or channel. (On Earth, such channels are common where meltwater streams emerge from the front of a glacier.) Such channels indicate that the stream's sediment load (quanitity of sediment) or its water flow was large, or that both occurred together. Streams where the sediment load is small compared to the water flow and where the stream slope is gentle tend to develop meanders. Sometimes a stream channel can end up as an elevated ridge, winding across the Martian landscape. How does such a thing happen? The process starts when a stream channel becomes filled with a material, such as lava, that is tougher and harder to erode than the rocks containing the channel. As the softer landscape rocks continue to erode, the lava-filled channel will gradually rise above them. In the end it will be left standing high as a ridge. Many old valley networks have been filled, buried, and, in some cases, exhumed unearthed and inverted or overturned, all across the planet. In outflow channels such as Kasei, the channel bed in places shows, in places, abrupt ledges and step-offs facing downstream. Scientists call these dry waterfalls or dry cataracts. They are places where the flow passed over resistant rock, then encountered a stretch that was more easily eroded. The result was a ledge that the water poured over — in short, a waterfall. Niagara Falls on Earth is about 50 meters (160 feet) high. Combined, the American and Canadian Falls are just 1.1 kilometers (3,700 ft) wide. The cataracts in Kasei, however, stood 400 to 500 meters (1,300 to 1,600 feet) high. And the cataract lip over which the water spilled extended for more than 100 kilometers. Today, the closest terrestrial counterpart is the 120-meter (400 ft) high Dry Falls cataract in Grand Coulee, part of the Channeled Scablands of Washington State. 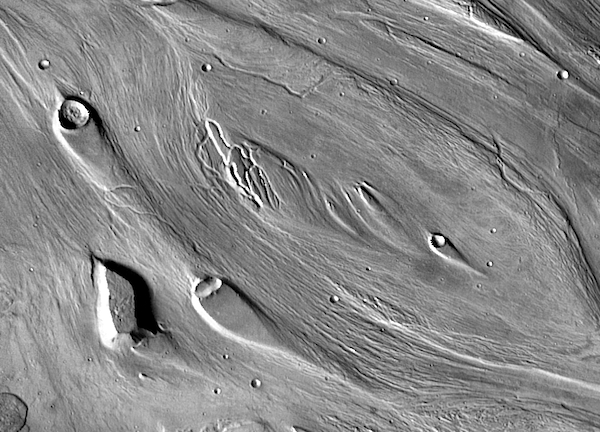 A channel that meanders (winds back and forth) is a common feature of terrestrial streams, and Martian channels follow the pattern also. Anyone who has canoed, kayaked, or inner-tubed down such a stream has personally experienced the characteristic features of a meandering channel. At each bend, the water flows fastest on the outside. This undermines the stream bank, and deepens the channel bed there. On the inside of the bend, the flow runs slowest, and mud, sand, and gravel settle out and accumulate to make a shallow bar. Undermining the bank on the outside of the bend causes the meander to move downstream. Eventually the erosion will cut through to the next bend, and the stream briefly straightens its path. On Earth, the cutoff portions of the channel become curving "ox-bow" lakes. As many years pass, these fill up with windblown dust and silt and vegetation, slowly becoming swamps, marshes, and then meadows. 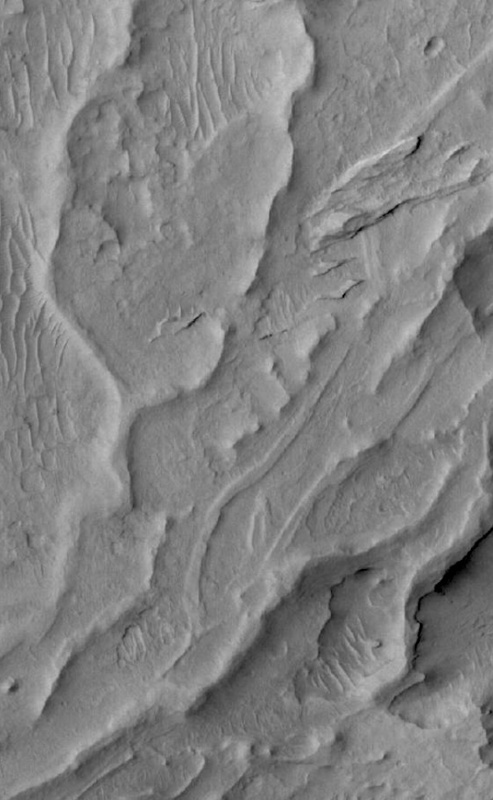 On Mars, meandering streams generally do not show the full development of shapes seen on Earth. This is probably because the Martian streams did not flow for long enough. The closest Mars comes to having ox-bow lakes are cutoff portions of winding channels in deltas that formed in crater lakes. Unlike lineations or streamlined islands, alluvial fans are features where flowing water has added something rather than taking it away. When a stream descends into a large, open space such as a valley or a crater interior, the stream spreads out and begins to flows more slowly. When this happens, the slow-flowing water drops the sediment it is carrying. Heaviest and largest particles drop first, followed by steadily smaller and lighter particles the further the water flows. Finally, the water spreads out so much it sinks into the ground or evaporates. Scientists call the landscape feature that results from this process an alluvial fan. Such features are common on both Earth and Mars. They lie at the foot of a canyon or valley where a stream emerges from higher ground. In places where many streams emerge close together, their alluvial fans can join to make what scientists call a bajada (ba-HAH-da). This is a broad, gently sloping surface of sand, gravel, and clay lying at the foot of higher ground. The sediment in a fan contains a mix of sizes throughout. But coarser, rougher, and larger rocks and gravel lie higher up the fan, closer to where the stream came out of the high ground. And the sediments at the fan's far edge tend to be smaller and more rounded. For exploration purposes, sending a rover to visit an alluvial fan allows it to sample rocks and sediment washed down from the stream's entire watershed or catchment basin. A delta forms much like an alluvial fan, but it accumulates in a body of water instead of the open air. When a stream carrying sediment enters a lake or sea, the flow loses speed. As this happens, the sediment settles to the bottom near the shoreline. If the stream continues to flow, the delta continues to grow into the body of water. 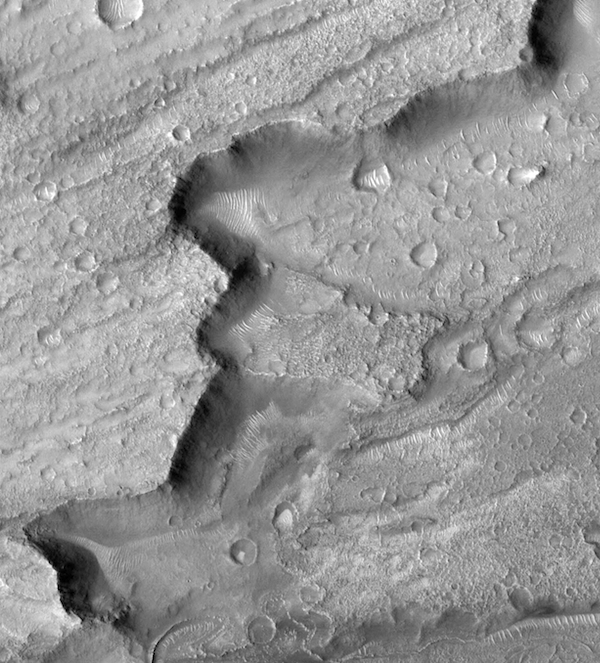 The most famous example of a delta on Mars is one in Eberswalde Crater. Scientists think it formed underwater in a crater lake. The delta has a complex structure with several layers and channels that weave back and forth. This suggests that the feature was active over a considerable time, possibly hundreds or thousands of years. No bodies of standing water currently exist on Mars. And all former deltas now lie exposed to view, just like alluvial fans. Thus sending a Mars rover to an ancient delta lets scientists explore the rocks and sediment that eroded from the ancient stream's watershed. In fact, Eberswalde Crater's delta was one of the Final Four landing sites considered for Curiosity, NASA's Mars Science Laboratory rover. 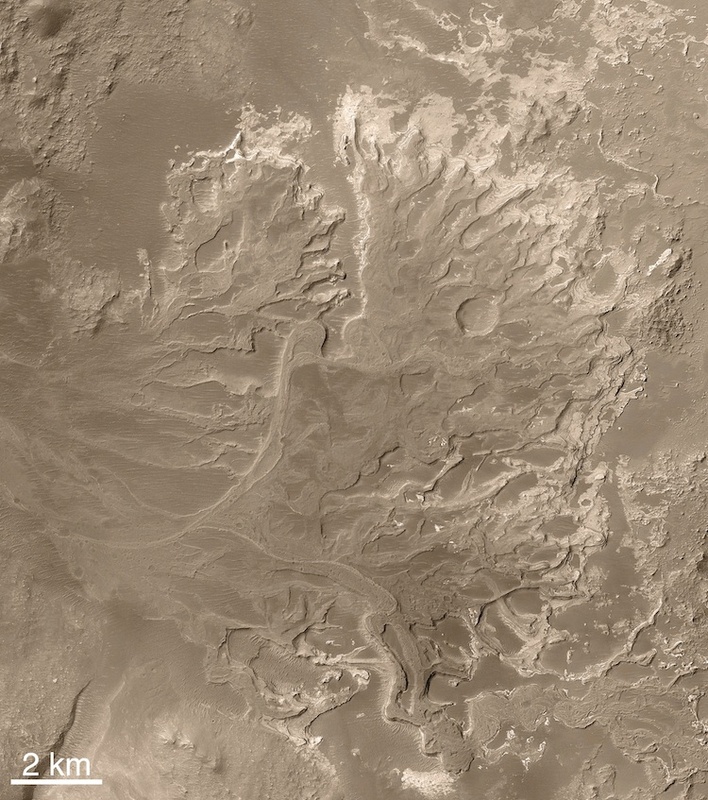 Gale Crater, however, got the nod, thanks to its giant mound of water-altered sediments.